Welcome to this wonderful Dutch Colonial on an exquisitely landscaped lot in Garrett Park! Built in 1964, this home features a large sun-filled living room with a brick fireplace and newly installed recessed lighting, an open dining room, a spacious kitchen with breakfast room and access to rear backyard and a main level powder room. There are five bedrooms and two full baths on the upper level, including a master bedroom with generous closet space and a private bath. The lower level of this home boasts a bright family room with new Berber carpeting, a half bath and a huge storage / work room / laundry room. The exterior of the property features a private driveway, a charming Flagstone pathway, and an extensive level backyard with a picturesque deck with built-in bench seating, a fire-pit area, garden beds and beautiful lush landscaping. It is rare to find a property in close-in Montgomery County with such an extraordinary backyard – just stunning landscaping – a true gardener’s paradise! The property is nestled in the Town of Garrett Park. Garrett Park is known for its close-knit community and independent spirit with its own post office, swimming pool, and the Black Market Bistro. 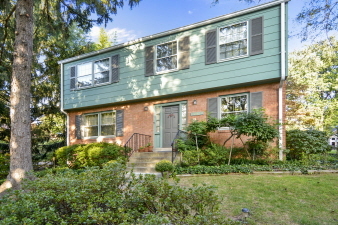 This property is conveniently located just blocks to the MARC train, Garrett Park Elementary School, Garrett Park Nursery, Rock Creek Park, Strathmore Music Hall, Grosvenor Metro, Whole Foods and the new North Bethesda Shops.